The Target Project is a graduate project from the Royal College of Arts in London. 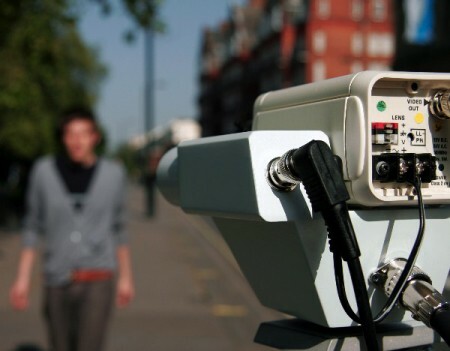 It is designed to make us question our relationship with surveillance technology and CCTV. This is a particularly meaningful demonstration for a country like Britain which is said to contain up to 4.2 million CCTV cameras or roughly 1 for every 14 people. This project has two demonstrations on their site. The first is dubbed the RTS-2 (Racial Targeting System). This system is essentially a camera which follows faces and is able to analyze and interpret the person’s race. The second is SOLA. This system is able to quickly scan someone and calculate their body mass index then publish this information to the web. Both systems achieve their goal by blatantly pointing out a line in which more surveillance does not equate to more security. They also show the wealth of personal data that can be obtained about a person by a simple camera. I remember a few years ago seeing some lady in NY doing something kind of like this. She hooked up a bunch of cctv cameras and captured people as they walked by, I think some of the cameras where in sculptures she made. I don’t see why cameras in public bother people so much though. Around here if anyone sees a camera they start complaining about privacy. I think this is a neat idea anyways. The BMI calculator is interesting. If it’s accurate enough, it could theoretically be used for calculating the amount of anesthetic needed for safely anesthetizing someone, making Hollywood-style “sleepy darts” somewhat closer to reality. It is amazing what technology is coming out today. Maily wireless, yet so advanced. Thanks for the post. Sounds pretty neat. I wonder how far they have gone with blending art and technology. If anyone has recently gone to have their passport photo taken you’ve noticed that now you are no longer allowed to smile into the camera. This is because of government’s increase use of facial recognition, and a smiling face with wrinkles around the mouth tends not to work so well.